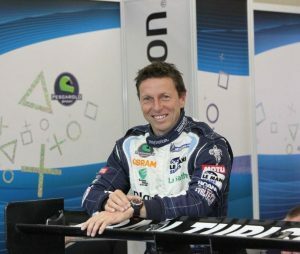 Saint Honoré recently took part in the Le Mans 24 race alongside Christophe Tinseau, driver from the Pescarolo team, which came 8th of the 55 teams that entered the race. 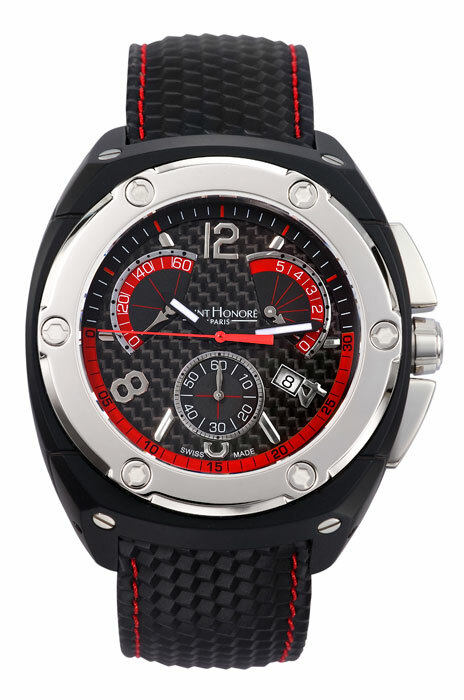 The brand chose this famous motor race, which was held on 13th and 14th June 2009, for the launch of the new “Red Racing” Haussman Magnum, and the first model in this limited edition was worn by Christophe Tinseau. Fitted with a quartz movement, this chronograph, water-resistant to 5 bars, has a black PVD finish steel case, a steel bezel, a sapphire glass and a black “carbon design” strap with butterfly buckle. The carbon dial displays the date at 4h and has 3 retrograde counters (30 seconds, 5 minutes and 60 minutes). 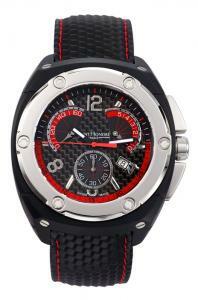 This is a design sure to delight car fans as well as amateurs of elegant watches. The brand has once again renewed its commitment to motor sports; Saint Honoré has in fact taken part in the Le Mans race several times with Paul Belmondo, the famous French car driver who has been the brand’s ambassador since 2005. Saint Honoré is also present in water sports: The French team at the 32nd “America’s Cup” in 2007 in Valencia, the French sailing team “K-Challenge” has enjoyed the brand’s support since 2008 as official time-keeper and, led by Sébastien Col, will again defend the French colours at the famous race’s 2011 event. 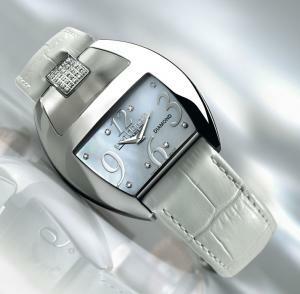 The brand also pays particular attention to women, as demonstrated by the “Charisma” range with its strong personality. The steel or 18 carat pink or yellow gold-plated case, in the shape of a stylized “H” is reminiscent of the Saint-Honoré logo, masking the crown. Instead of a traditional clasp on the case, the leather or metal strap is fixed to a transparent glass in a daring, lightweight look: the whole watch appears to float in space. In the paved version the clasp is set with 25 diamonds. Dials offers a choice between black or mother of pearl versions with large size Arabic numerals, or elegant versions with Roman numerals. "Charisma" : Steel case water-resistant to 5 bars, mother of pearl dial set with 8 diamonds, paved clasp on the case, white leather strap.